A latching relay is a special kind of relay. While a conventional relay uses power continuously when its internal switch is to be closed (relay energised), a latching relay requires only a brief voltage pulse to change state. This makes latching relays perfect for any situation in which energy saving is important – for example battery powered systems where the relay needs to stay energised for extended periods of time. There are different configurations of latching relay, but the simplest to understand and use has three (or four) coil terminals rather than the two found on a conventional relay. If a high enough voltage (specified in the rating of the relay) is put across one pair of these terminals, the relay switch will close and stay closed even when the voltage is removed. If the same voltage is put across another combination of two of the three (or four) terminals, the relay switch will open again and stay open even when the voltage is removed. Whether the voltage across the terminals is there for just 20 milliseconds, stays on for 10 seconds, or goes on and off randomly for a all day, the effect will be the same – the relay will change state once and then remain in the new state until a voltage is put across the other terminals. Therefore, although you typically need an electronic solution to generate the necessary pulses of voltage, you don’t have to be too exact about things. In order to control latching relays we typically use a PICAXE microcontroller since these have multiple outputs and so can easily be programmed to send the brief voltage pulse to either open or close the relay’s internal switch as required. Latching relays are not always that easy to find – particularly if you need to use one to switch a high current (>2 Amps) – however they are available online relatively inexpensively. A good starting point is to search ebay. Click here to search for the current listings for Latching Relay. Click here for a wide selection of Latching Relays available on sale. 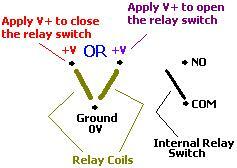 NEW Click here to find out how to Make your own Latching Relay.